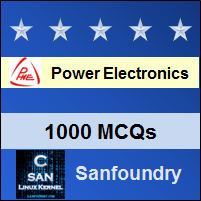 This set of Power Electronics Multiple Choice Questions & Answers (MCQs) focuses on “Three Phase Converters- 3”. 1. A three-phase full converter supplied from a 230 V source is working as a line commutated inverter. The load consists of RLE type with R = 5 Ω, E = 200 V and L = 1 mH. A continues current of 10 A is flowing through the load, find the value of the firing angle delay. α = cos-1(-150π/3√2×230) = 118.88°. 2. A three-phase full converter is driving a DC motor. If a continues current of Im amperes is flowing through the motor load, then find the rms value of supply current drawn by the converter to drive the motor. (IS)2 = (1/π) x (Im)2 x (2π/3) = Im√2/√3. 3. Name the below given circuit. 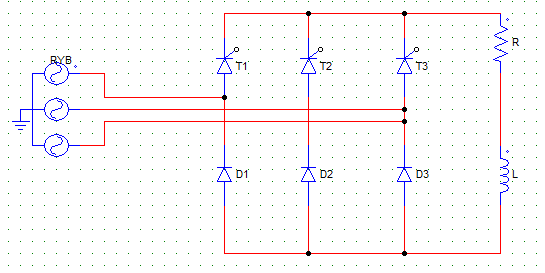 Explanation: It uses 3 SCRs and 3 diodes, hence it is a semi-converter. Option (b) and (d) make no sense, because there can be no full controlled semi-converter. Explanation: At any given time, one SCR and one diode is conducting, each conduct for 120° per cycle. 5. In the below given circuit, __ and __ conduct along with T2. Explanation: When one SCR conducts, a diode conducts along with it at a time to provide the path of current flow. . For example, if T2 starts conducting at 90° it will conduct till 90+120 = 210°. But while T2 is conducting, half of the time i.e. from 90 to 150 D1 is conducting and another half of the time D3 is conducting. T2 and D2 cannot conduct together as it will cause a short circuit. Hence, T2-D1 conduct for 60° and then T2-D3 conduct for another 60°. 6. In a three-phase semi-converter, at a time one SCR and one diode conduct simultaneously. With SCR T1 conducting which diode(s) is most likely to conduct along with T1? Explanation: T1 and D1 together will cause a S.C. D2 or D3 any of these two can conduct along with T1 depending on which phase voltage is currently active RB or RY. 7. What is the value of voltage at the output terminal when the freewheeling diode (FD) is conducting? Explanation: When FD is conducting it will short circuit the load terminal resulting in zero voltage. It won’t be E because the terminals are shorted. It can be E when none of the devices are conducting (This can happen only when α > 120°). 8. 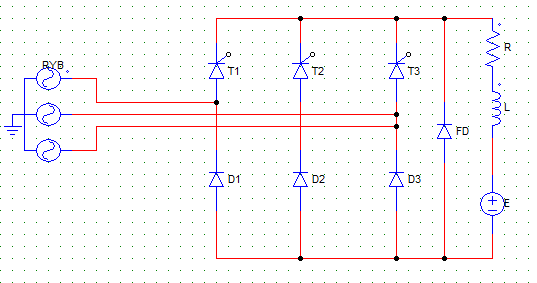 A 3-phase full converter feeds power to an R load of 10 Ω. For a firing angle delay of 30° the load takes 5 kW. An inductor of large value is also connected to the load to make the current ripple free. Find the value of per phase input voltage. Vs (phase) = 191/√3 V.
9. A three-phase semi-converter circuit is given a supply of 400 V. It produces at the output terminals an average voltage of 381 V. Find the rectification efficiency of the converter circuit. Therefore, Rectification efficiency = 381/400 = 95.25 %. Explanation: In case of a semi-converter operating with α < 60°, FD does not comes into play, as the voltage never falls to zero and gives no chance for the inductor to discharge.